New floors and a new look for the house! When we first visited this house, we had to use a little imagination to see past the surface into its potential. We noted the ugly paint, chaotic landscaping, gaudy drapes, and worn carpet, but we didn’t become those people on the “House Hunters” shows, turning down a good home just because the bathtub is green. We decided it was more of a Charlie Brown Christmas situation, where it just needs a little love and a little work to make it look wonderful. And we’re getting there, bit by bit. Home improvements are not cheap, and saving money by deciding to do it ourselves comes with its own problems, like steep learning curves, spending weekends painting and ripping down wallpaper, and billions of trips to Home Depot. But our home is finally looking like we’ve wanted it to from the start, and I’m very happy about the progress we’ve made. It took us two years to do it, but we finally have new floors. The old carpet in the living and dining rooms was thin, worn, and stained. And blue. Dirty blue. From the beginning, we wanted to replace it with clean hardwood floors, to open up the space. And today, the floors are finished. 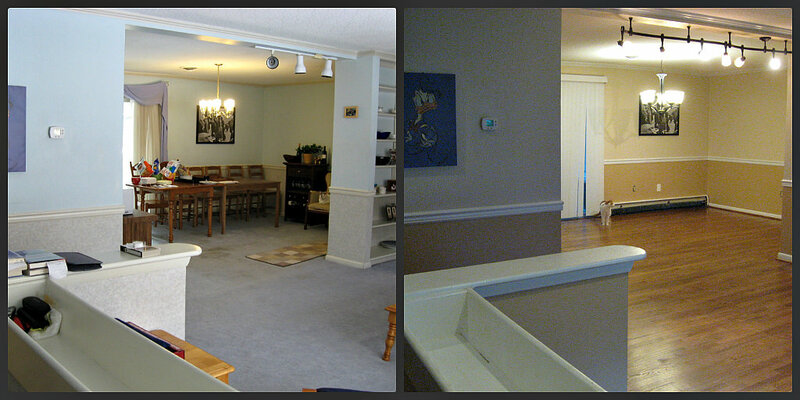 Dining room, before and after. As with most other projects in this house, the floors took a lot longer than I expected. Part of this is the sales guy’s fault. He kept saying “three days”, so I thought I’d walk in after a long weekend’s worth of contractors in and out of my house and find my shiny new floors. It did not work that way. Note to self: stop trusting sales guys when they tell you how long something will take. There was already some hardwood floor under the carpet, and at first we thought we’d be able to use it and save a little money – just have the guys sand it down and re-stain it to the color we wanted. But once the carpet came up, we encountered a problem. First of all, the hardwood didn’t extend the whole way through the rooms. The last four feet or so of each room was just naked particleboard, and the interface between it and the hardwood was covered in a thick layer of glue. We decided to go ahead and tear out the old stuff, because even though the glue could be removed, the old floor was very uneven. It may have been old water damage, we’re not sure, but if I ran my hand over it, I could feel that it was bumpy and wavy, and I knew it would bother me if we left it like that. I guess I could have thrown a rug over the weird spots, but then what’s the point of the new floor? The wavy floor problem caused a delay, because the boss had to come by and look at it, and then they had to go out and buy more wood for us, because the verdict was that not much could be done to rescue the old floor. We were given the option of pre-finished floors or unfinished ones that would be sanded in place and then stained, and we decided on the unfinished ones for a tighter look. The pre-finished ones tend to have teeny gaps between the slats, which we didn’t like. Also, since we weren’t replacing the wood stairs or the undamaged upstairs hallway, they would be sanding and staining those, and matching that stain to the pre-finished stuff would be harder. Instead, we opted to get naked oak floors, and have them sand and stain everything to match. Messier, but worth it. Then the demolition began, and we discovered that the sub-floor was extremely thin, and not to current building codes. Only 3/8″ thick, when code is 5/8″. It bounced when we walked on it, so the floor guys drew lines to show us where the joists were so we wouldn’t end up with a leg in the crawlspace beneath the floor. There was another delay, as they went and bought new plywood to put down over the old stuff to solidify our floor. I’m glad they did, of course, but it was another week and a few hundred more dollars of materials to get it done. They laid the new oak floors down, and were almost completely done before I noticed a bump in the floor. The boards that met over the bump seemed to be sticking up a little, and I was nervous about the long-term durability of that area – would the boards warp and pop up? Once again, we called the boss in for a look, and he explained that the bump was from the old foundation, before the addition was put on the house. The floor joists go in one direction until that wall underneath, then the addition had the joists going the other way. We have no idea why they did it that way, but the remaining foundation wall is raised up just enough to cause a bump. We had a choice: live with the bump, or have them pull everything back up and completely rebuild the floor. With reassurances from the boss that the floor would not pop up in that spot, and they would come back and fix it free of charge if it did (although I have my doubts on that), we decided not to spend tens of thousands of dollars on rebuilding a whole floor. If you ever come over and see a rug in front of the living room fireplace, you’ll know why! Once the floor was in, the finishing crew came to sand and stain it all. That, too, took longer than usual, because the guys kept showing up late (past 10:30, despite telling us they’d be here at 8:30), and when they first came they seemed unclear on what their work order included, so we once again had to get the boss involved. And they were grumpy that we hadn’t moved our furniture from the rooms – but nobody told us to! The sanding took a whole day, and required some really loud equipment with a vacuum attached to cut down on sawdust getting everywhere. Sawdust still got everywhere. The vacuum bag got most of the bigger stuff, but the fine powder got through and settled on every surface it could find! On the second day, they stained the floors with “gunstock” stain, and put on a coating of quick-drying water-based polyurethane, but they ran out of time for the next two coats and had to come back a few days later to finish up. It was worth the hassle and the delays, because our house is now completely blue-carpet-free! The color turned out exactly how we wanted it, and it’s shiny and slick and makes the place look a lot nicer. It’s also tons of fun to watch the cats run on it, trying, and failing, to get traction for their high-speed turns. Now if you’ll excuse me, I have a lot of dusting to do! This entry was posted in Uncategorized on July 21, 2012 by antijen. Very helpful for those who intend to do it themselves.thanks for insightful post.